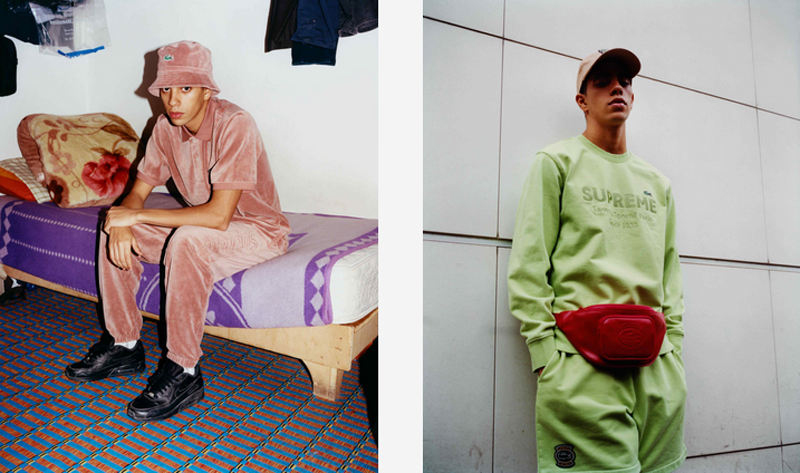 After rumors circulated on the internet over the weekend, cult NYC-based streetwear label Supreme announced on Monday that its second collaborative collection with French heritage sportswear brand Lacoste will launch later this week. The collection puts an original twist on a number of Lacoste classics, with stand-out pieces including a track top, polo, track pant and bucket hat available in five shades of velour, ranging from basic black or white to a dusty pastel pink and a zesty orange. Other apparel pieces in the collection include a wool varsity jacket featuring a mashup of the Lacoste and Supreme logos, a nylon anorak and track pant set printed with a reflective grid pattern, as well as a hooded sweatshirt, a crewneck sweatshirt and a sweatshort. The collection also includes a range of accessories, such as a nylon cap, a twill 6-panel hat, a waist bag and a shoulder bag. Colors are generally bright, mixing pastels and citrus tones with more sober black and beige pieces and Supreme’s classic white and red. All pieces feature Lacoste’s iconic crocodile logo as well as Supreme branding. The two brands last partnered up in March of last year and online platforms such as Instagram were rife with speculation this weekend, with Supreme fan accounts such as @supreme_leaks_news and @dropsbyjay claiming that the next collaborative collection was set to drop at some point this week. And if the excited reactions to the campaign photos posted by Supreme on the brand's official Instagram account are anything to go by, fans have not been disappointed by the latest iteration of the partnership. 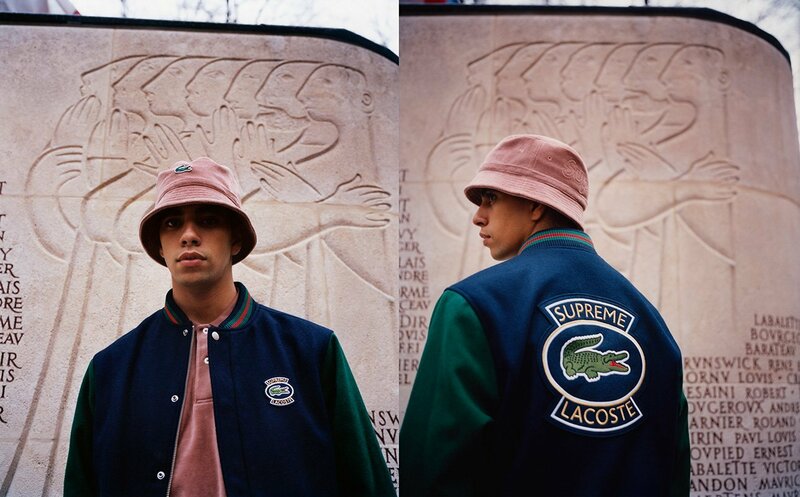 The Supreme x Lacoste collection will be available in Supreme stores in New York, Brooklyn, Los Angeles, London and Paris, as well as online from April 19, and will launch in Japan on April 21. Prices have not yet been confirmed.